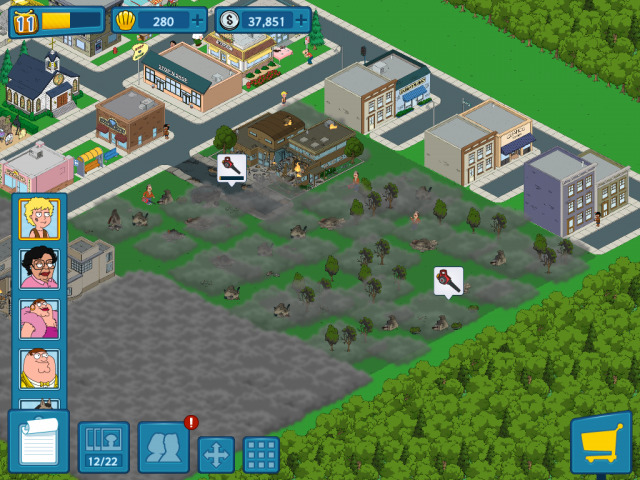 In the world of Freemium Grinders under the City Building genre there are few games that can match the strength and the complexity of EA's The Simpsons: Tapped Out. Other studios have tried - because the fun and popular format also happens to be very profitable - but until now nobody has come close to reaching the quality and depth level necessary to compete with Tapped Out. We suspect that the reason for this is not so much game quality and depth, but the IP behind the game. With its longevity, popularity, and deep deep reach into popular culture, The Simpsons may very well be a license to print money, but at least now they have real competition! TinyCo's Family Guy: The Quest for Stuff is that competition, having a very similar look, feel, and game play experience to it. So familiar in fact that a lot of players feel like it is a copy of the previous title, though considering its unique approach and different mechanics we think that the correct word is "similar" and not "copy" to be fair. 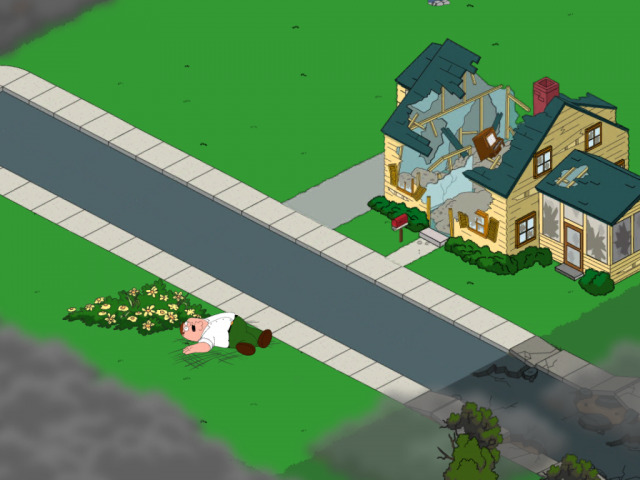 The basic premise of the game is simple enough - we find ourselves in the town of Quahog in the Family Guy universe, and a special Town Meeting has been called in which among the surprises is the news that the show has once again been canceled. But as the shocked citizens take in this news, it is revealed that it is not the studio so much as it is Peter's arch enemy The Chicken who is behind this bad news. An epic battle soon unfolds as Peter and The Chicken go head-to-head, with the results being the utter and complete destruction of Quahog! When the dust settles, The Chicken appears to have won this battle, and Peter Griffin is left passed out alone in the rubble, his destroyed home and town around him. The player helps him to get up, dust himself off, and take stock of the situation. There is nothing left for it but for Peter to roll up his sleeves and get to work rebuilding the town! The game starts in earnest from that point. As this is a game offering in the City Building genre of the Freemium Grinder persuasion, it is time for us to discuss the costs in terms of game play here. The first point that should be made is that, ignoring for a moment the refreshingly up-front manner in which the studio addresses that issue. This is an issue of sorts because the appearance of that quest, so early in the game play, has caused a lot of gamers to walk away in disgust declaring that the game is little more than a semi-concealed scam to target their wallets. That is completely inaccurate and an unfair judgement of this game, and we will tell you why! Like Tapped Out, Quest for Stuff is one of the rare games that is being developed as if it were a retail-boxed-game project. That means a very significant amount of effort and quality has been put to it and continues to be expended. That costs money. Making ANY game, even the shovelware type, costs money today, and that early quest was not so much about taking the first dig into your wallet as it was about offering an honest statement that this IS a Freemium Grinder of the City Building persuasion - and that means that the people who make it are going to try -- often -- to encourage the people who play it to SPEND MONEY! That is OK. In fact their honesty about that is refreshing, but you know what makes it even more OK? The fact that unlike Tapped Out, which is very smooth and clever about getting you to spend money but limits the ways that you can get free access to its premium currency, the folks at Quest for Stuff are giving the premium currency away! You read that right. Between the 1 Clam a day you can collect for visiting neighbor towns, and the dozens of Clams that are part of the rewards for key Missions and Quests, they have also created a Collections System whose rewards are - wait for it - CLAMS. So as you go about playing the game as you already normally will, unlocking new costumes, new characters, and the like, you will automatically be completing collections that will reward you in Clams - the premium currency you are supposed to pay for. Why do this? After careful examination of the game we have come to the conclusion that TinyCo built the free Clams into the game so as to enable players who will not be spending real-world money to still have the ability to obtain and unlock some of the key tools in the game that they need. Specifically the free Clams that the player can get will allow them eventually to obtain the three additional "Builders" (think laborers who are necessary to complete every building and clearing project in the game). That is not the action of a company whose sole interest is gaining access to your wallet - it is the action of a studio that wants to ensure that everybody can obtain a fun and rewarding game play experience from their game! The cost for playing Quest for Stuff is ZERO Dollars if you do not want to partake in the Premium side of the game. So far there are no ads to interfere with your game play, and the in-game purchase system is well-balanced so that if you choose not to participate you still obtain almost the same game play experience as those that do. The design and the graphical world in QfS is very high quality, in fact it is clear from the animation (and the screens we share in this review) that every effort has been made to keep the video game on an equal footing with the show itself. 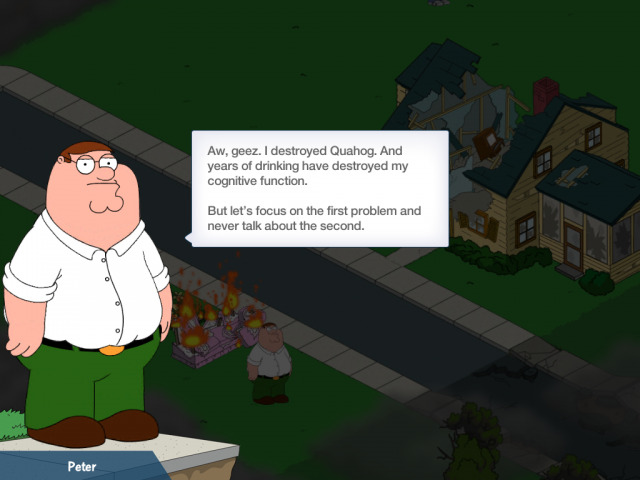 Peter is clearly Peter, Joe is Joe, and the world in the game is easy to recognize because it IS Quahog! The music appears to have been composed by the same folks who do it for the show - either that or it is drawn from the music library OF the show. That is fine regardless because you still end up with a soundtrack of the sort you would expect in the TV show and not so much a game. Call it win-win. Unfortunately we also need to address the language in this game - because it is a faithful interpretation of the show. Being that, the characters will often say some pretty outrageous things - things that are most decidedly NSFW or even not suitable for playing around kids. But that is OK because they are totally upfront with you about that. In fact the game itself when it starts, WARNS you about it, and even goes so far as to suggest that you wear headphones when you play. For what you have to pay - which is nothing - this game is worth it at ten times the price. Spending a few bucks on the premium currency - for instance spending the $5 for the early quest to spend $5 - strikes us as a very inexpensive price for admission even if it was mandatory. 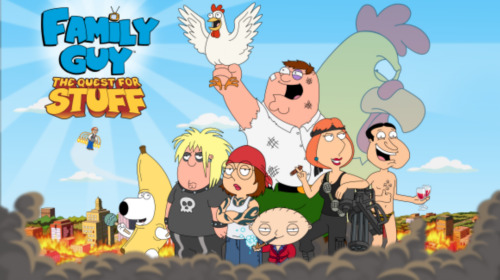 It is clear from the level of play we have experienced so far, and the aggressive manner in which the studio is both updating the game and expanding it, that Quest for Stuff has the same level of value and draw as Tapped Out - which is good news for fans of the Family Guy universe! Its value in terms of game play and entertainment far exceeds any voluntary cost you may choose to spend while playing it. The quest and story lines are solid, the support system that has been put in place is rock solid, heck the only thing wrong with this game is waiting out the timers for completing tasks, but then as that is the very heart of the city-building Freemium-Grinder we really cannot complain about that either!